Welcome 2016 with excellent charms and decorations to enhance your prosperity, luck, and success for the 2016 Year of the Monkey! 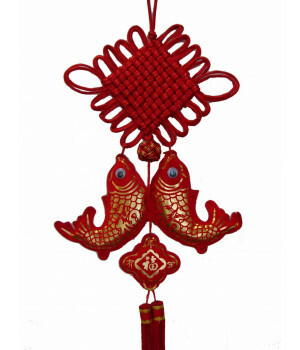 This beautiful New Year Decoration Charm features a pair of golden fish and a large red mystic knot. There is also a plush figurine below the fish with the Chinese character of “fu” meaning good fortune and luck. 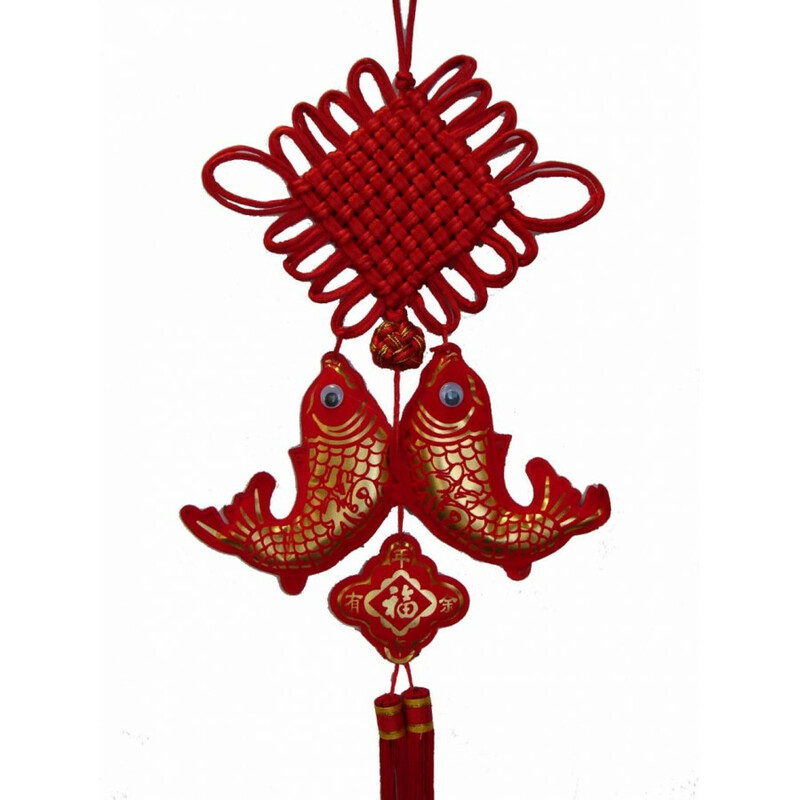 Both the mystic knot and golden fish are powerful representations of positive chi and successful advancements. These golden fish are popular representations of wealth and are used to attract wealth luck for its owners. The Chinese character for fish “yu” also means prosperity and wealth; thus, fish are popularly displayed to enhance good luck and a positive influx of advancements and successful opportunities. Also known as the lucky knot, love knot, and infinity knot, the mystic knot is the most influential symbol in period 8, and brings extra good fortune to its beholder. The mystic knot is similar to infinity times three and the number eight tripled (eight is a lucky number), and has the power to ensure longevity and undying prosperity. The mystic knot is known to strengthen relationships, faith, wealth, health, and positive chi. Also known as the endless symbol, the mystic knot also symbolizes never-ending love and is the perfect symbol for lucky love and a long, healthy relationship. Use this wonderful New Year Decoration Charm for a smooth, peaceful, and successful 2016!! Material: It is made of satin fabric. Dimension: The mystic knot itself is approx. 10" x 7". The double fishes is approx. 11.5" x 6". The overall length is approx. 33". New Year Charm - Double F..